The copy proportion of a paid search text ad is, at its most basic, limited to two sections (though we’ve added a couple of extra to consider near the end) – the headline and the description, both of which have a more restrictive character limit than their organic search equivalent. The heading, for example, is restricted to 25 characters, while the description is limited to two lines of 35 characters each. 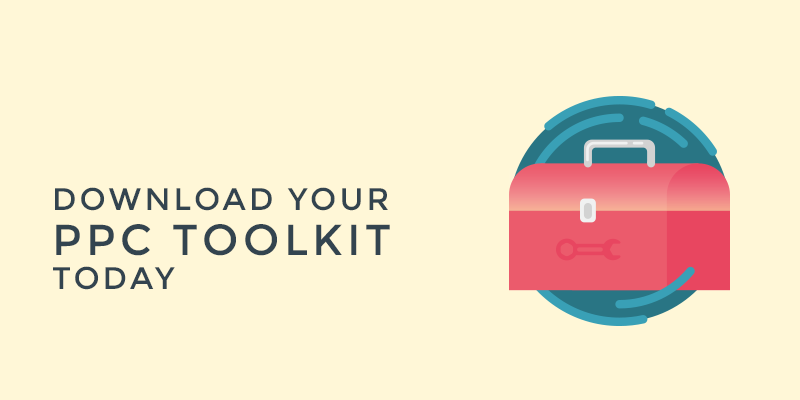 This means that you have 95 characters to make your mark and potentially make a sale. Essentially, a PPC ad is the search marketing equivalent of an ‘elevator pitch’, it has to have punch, convince and convert in a tiny space, and that’s where feel that advice comes in handy. Picking one of the screen captured ads from the previous image, we’ll go through each step. The following was chosen as, following a search for ‘iPhone’, I feel the ad caters well to what represents an ‘awareness’ level search. This ad was chosen following a search for ‘iPhone’ as the ad caters well to what represents an ‘awareness’ level search. With its heading, here, the ad manages to convey branding and an appropriate, awareness level, call to action (CTA). Your ad heading copy, as with that highlighted above, can be written in a number of ways, but should always consider what you want to achieve and whether that is compatible with the keywords for which you are competing. For example, if you are looking at placing an ad for your business which is pitching fairly low in the conversion funnel – ie at a point where the consumer is settled on the item or service they wish to buy, but not yet from where to buy it – your heading needs to cater to that level. Had I searched for ‘cheap iPhones’ or ‘iPhone deals’, the above heading has the benefit that it would retain relevancy for the purchase level search terms. In the same regard, for a generic ad for a holiday firm, the heading should highlight a unique selling point (USP). As many holiday firms will compete for most of the same keywords, it is important that this copy, the most eye catching section, offers something unique. 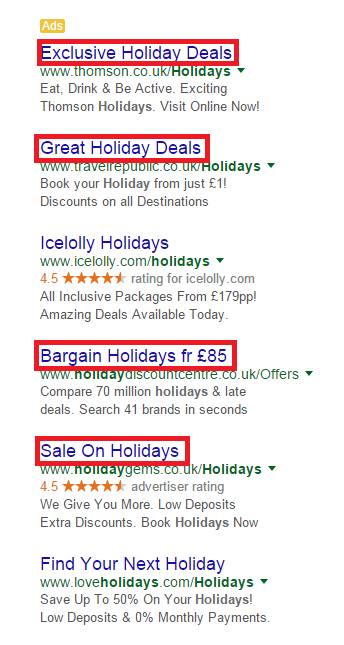 Here we can see a number of companies positioning themselves with a USP – with the use of ‘deals’, ‘bargain’, ‘exclusive’ and ‘sale’ featuring in ads for the rather generic search term ‘holidays’. 2. Your heading must set you apart from other brands. In this regard (especially for searches lower in the conversion funnel), the inclusion of sale terms is a fantastic device. It is often recommended that any registered or trademarked items or services are marked as such – as the use of special symbols (where appropriate, most of us remember Google’s early days, and wouldn’t wish to return) can be eye catching. Having snared the consumer with a catchy heading, the description section of your ad offers slightly more freedom in terms of characters, but the brief remains mostly the same as with the heading, except that rather than attract the description seeks to engage. In AdWords, the character limit is spread over two lines – description line 1 and 2. Anyone that has taken a creative writing class will be familiar with the importance placed on title and opening line – but as a metaphor for ad copy, those who have not need only place themselves in the shoes of someone looking to purchase a new book. While the heading, like the title of a novel, seeks to draw the reader in, the description, like the opening line, needs to create the desire to see more. Each of these quotes seeks to inspire intrigue, a sense of mystery and a desire to read on, and this is the same feeling good ad description copy should inspire. Though there is no need to craft miniature works of literature, there are other tools at the advertiser’s disposal. As we can see here, from a generic search for ‘shoes’ the descriptions in these text ads all seek to capitalise on an initial interest (partially warped by the probable remarketing ad from Next – visited for another blog). 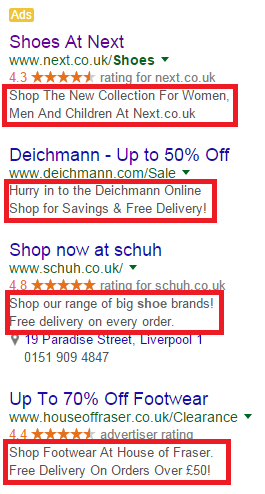 They state their USP’s clearly, feature offers; three repeat their brand name while the fourth, Schuh, mention their range of ‘big’ brands, three mention (capped up) ‘Free’ delivery, one uses the imperative verb ‘hurry’ to create a sense of transience around their ‘savings’ – as though they might be missed, while all of them feature some form of imperative CTA. In addition to the language, note that only one ad uses sentence case, while the rest are (mostly) first letter capped, three use exclamation marks to reinforce their message and two use special characters to create space in the ad. If you check back on the previous examples, you’ll see the same tactics employed over and over – concision, USP, special characters, first letter capping, CTA imperatives, exclamations, strong branding. All in 66 characters over two lines – to make the most of the 70 character limit. Think like your consumer – what are they looking for? What is most important to them in their search at each stage of the conversion funnel and how can you cater to it? Employ capitalisation(sparingly) and punctuation to good effect – caps and exclamation marks are generally associated, at a base psychological level, with warning and importance, they naturally draw the eye. Make the most of your USP and offers – as the old saying goes: ‘don’t hide your light under a bushel’, by which the historic, virtually nonsensical metaphor essentially means ‘if you’ve got it, flaunt it’. If you’re cheaper than everyone else then say so, if you’ve a sale on then make it known. Use imperatives and CTA’s – as with the first lines quoted above, you want to inspire action in the consumer, compel them to do what you want them to do, let them know what a devastatingly short time they have to act, and that they have to act now! URL – this does not necessarily have to be the URL of the page they will eventually land on (though it does have to have the same domain name), but look back through the examples and you will see a lot of compact URL’s featuring either the searched keyword, ‘offers’, ‘sale’ or ‘clearance’. A short, descriptive URL can be reassuring to the consumer that they are choosing the right link. Landing page copy – though not a part of the ad itself, the landing page copy is a part of the ad experience and could make the difference between a positive or negative consumer interaction with your brand. Don’t let your ad down with irrelevant or sloppy copy at their destination. 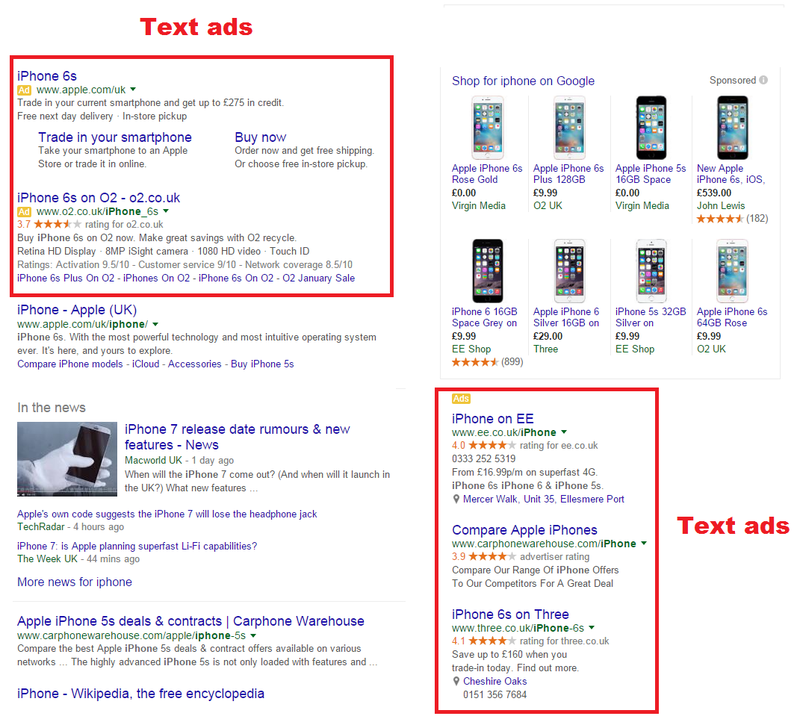 Though there are clearly other areas which can improve a text ad (how many different types of ‘extension’ did you spot? ), the basics of ad copy are those above. Feel we’ve missed anything? Want to know how we can help deliver paid search success for your brand? Why not contact us today?